After an early morning hike to the entrance of the narrows of Zion we headed back out of the park as droves and droves of vehicles lined up to get in. It was Martin Luther King day the Monday we were there and the government had opened all National Parks and declared them free for the day. Needless to say, the locals were driving in from hundreds of miles away to enjoy themselves at Zion. I don’t blame them, the place is incredible. Our mission for today was to make some kind of progress towards the Grand Canyon. On the way towards our destination we learned about the Coral Pink Sand Dunes and decided to make a short side journey out to see them. Upon arrival we were greeted with the sound of dune buggies zipping their way across the dunes. Apparently, they opened the dunes to recreational vehicles. I would love to drive one of them across the dunes at high speed, it looked like a lot of fun. After watching the buggies speed around the dunes we made our way back to the ranger station at the entrance to look for a map. Unfortunately, the ranger didn’t have one, but he did have a really cool collection of sand from throughout the world. One thing that Annie and I wanted to do while we were out west was see one of the many slot canyons in the area. At the ranger station I asked the ranger about any slot canyons nearby and he dropped a hint about one not too far away known as Red Canyon. Of course, you can’t find much info online about this one, easily anyways. It’s relatively unknown, except to locals who use the area for offroading and camping. Perfect. We made our way there and after a 2 mile drive through very deep sand made it to the mouth of the canyon, just as a group of quads were leaving. We had the place to ourselves, yes! We explored the canyon for about an hour and as soon as I turned the key on the Xterra, a group of motorbikes showed up. We couldn’t have had better timing. Having a slot canyon to yourself out west isn’t an easy feat, but we managed to do so on two separate occasions. After our quick hike into and out of Red Canyon we made our way back to a reserved hotel room in Kanab and ate some amazing calzones at a local pizza joint before crashing for the night. Considering we were utterly amazed at the beauty of Red Canyon, that evening we searched out another canyon in the area, Buckskin Gulch. 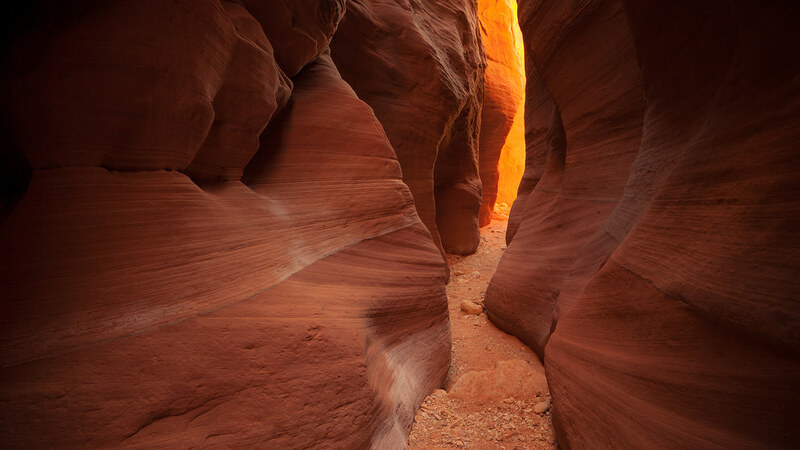 Buckskin Gulch is the deepest and longest slot canyon in the world. It is also easily within driving distance of where we were staying in Kanab. So, of course, we had to explore it! Buckskin Gulch shares the same trailhead as the much more known Coyote Buttes hike, the Wave. That was also bonus for us, because it meant the majority of the people hiking that day were going to the wave. Which, yet again, meant we had this amazing place all to ourselves. We arrived fairly early in the morning and were greeted with stunning light reflecting off the walls of Wire Pass, where this photograph was captured. Wire Pass connects the trail to Buckskin Gulch where they meet at a single confluence within a huge cavernous room with petroglyphs all over the walls. It was truly an incredible place. Our last destination was the Grand Canyon and while I did capture some photographs there, none of them do the majesty of the canyon justice. People spend their entire lives photographing the Grand Canyon and fall short of producing anything worthy of showing how amazing of a place it is. It truly is one of those locations you just have to experience for yourself. If you haven’t been there you are missing out on an amazing feeling. Standing atop the Grand Canyon really puts life and the history of the earth into perspective. I hope you truly enjoyed this series of photographs captured on my trip out west!